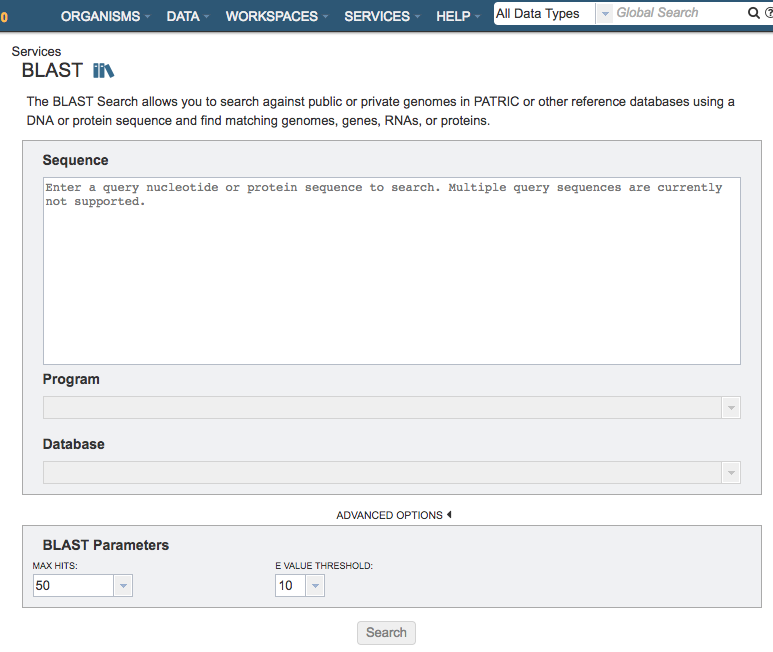 The PATRIC BLAST service integrates the BLAST (Basic Local Aligment Search Tool) algorithms to perform searches against against public or private genomes in PATRIC or other reference databases using a DNA or protein sequence and find matching genomes, genes, RNAs, or proteins. 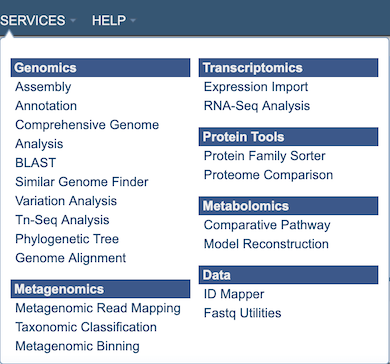 The BLAST submenu option under the Services main menu (Genomics category) opens the BLAST input form (shown below). Note: The BLAST Service can be used without logging in, but if you want to include your private genome in the BLAST results, you must be logged into PATRIC. Sequence: This is the entry box for either the nucleotide or amino acid target search sequence. Cut-and-paste is supported. Database: Dropdown list of a variety of PATRIC databases or user-selected data sets for searching. Depending upon the query type, searches are available for entire genomes or limited to only features. Specifically, blastn, tblastn, or tblastx, allows searches against either genomes or features. However, blastp or blastx are limited to features (proteins) only. BLAST Parameters: Allows adjustment of maximum number of hits returned and E value threshold. Search: Launches the search which, upon completion, returns a set of results matching the sequence provided and selected criteria. On the results page, the Edit form and resubmit Button above the search results reloads the input form so that the parameters can be easily adjusted and the search relaunched.